Glycolysis (from glycose, an older term for glucose + -lysis degradation) is the metabolic pathway that converts glucose C6H12O6, into pyruvate, CH3COCOO− + H+. The free energy released in this process is used to form the high-energy compounds ATP (adenosine triphosphate) and NADH (reduced nicotinamide adenine dinucleotide). Glycolysis is a determined sequence of ten enzyme-catalyzed reactions. The intermediates provide entry points to glycolysis. For example, most monosaccharides, such as fructose and galactose, can be converted to one of these intermediates. The intermediates may also be directly useful. For example, the intermediate dihydroxyacetone phosphate (DHAP) is a source of the glycerol that combines with fatty acids to form fat. 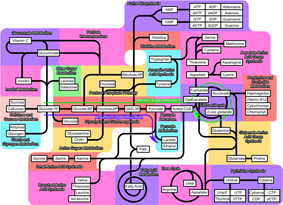 Glycolysis occurs, with variations, in nearly all organisms, both anaerobic. The wide occurrence of glycolysis indicates that it is one of the most ancient known metabolic pathways. Indeed, the reactions that constitute glycolysis and its parallel pathway, the pentose phosphate pathway, occur metal-catalyzed under conditions of the Archean ocean also in the absence of enzymes. Glycolysis could thus have originated from chemical constraints of the prebiotic world. The Pay Off Phase – in which ATP is produced. Charges are balanced by the difference between ADP and ATP. In the cellular environment, all three hydroxyl groups of ADP dissociate into −O- and H+, giving ADP3−, and this ion tends to exist in an ionic bond with Mg2+, giving ADPMg-. ATP behaves identically except that it has four hydroxyl groups, giving ATPMg2−. When these differences along with the true charges on the two phosphate groups are considered together, the net charges of −4 on each side are balanced. In 1860, fermentation. In 1897, Eduard Buchner found that extracts of certain cells can cause fermentation. In 1905, Arthur Harden and William Young along with Nick Sheppard determined that a heat-sensitive high-molecular-weight subcellular fraction (the enzymes) and a heat-insensitive low-molecular-weight cytoplasm fraction (ADP, ATP and NAD+ and other cofactors) are required together for fermentation to proceed. The details of the pathway were eventually determined by 1940, with a major input from Otto Meyerhof and some years later by Luis Leloir. The biggest difficulties in determining the intricacies of the pathway were due to the very short lifetime and low steady-state concentrations of the intermediates of the fast glycolytic reactions. The change in structure is an isomerization, in which the G6P has been converted to F6P. The reaction requires an enzyme, phosphohexose isomerase, to proceed. This reaction is freely reversible under normal cell conditions. However, it is often driven forward because of a low concentration of F6P, which is constantly consumed during the next step of glycolysis. Under conditions of high F6P concentration, this reaction readily runs in reverse. This phenomenon can be explained through Le Chatelier's Principle. Isomerization to a keto sugar is necessary for carbanion stabilization in the fourth reaction step (below). The energy expenditure of another ATP in this step is justified in 2 ways: The glycolytic process (up to this step) is now irreversible, and the energy supplied destabilizes the molecule. Because the reaction catalyzed by Phosphofructokinase 1 (PFK-1) is coupled to the hydrolysis of ATP, an energetically favorable step, it is, in essence, irreversible, and a different pathway must be used to do the reverse conversion during gluconeogenesis. This makes the reaction a key regulatory point (see below). This is also the rate-limiting step. Destabilizing the molecule in the previous reaction allows the hexose ring to be split by aldolase into two triose sugars, dihydroxyacetone phosphate, a ketose, and glyceraldehyde 3-phosphate, an aldose. There are two classes of aldolases: class I aldolases, present in animals and plants, and class II aldolases, present in fungi and bacteria; the two classes use different mechanisms in cleaving the ketose ring. The triose sugars are 1,3-bisphosphoglycerate. Hydrogen atom balance and charge balance are both maintained because the phosphate (Pi) group actually exists in the form of a hydrogen phosphate anion (HPO42-), which dissociates to contribute the extra H+ ion and gives a net charge of -3 on both sides. This step is the enzymatic transfer of a phosphate group from 1,3-bisphosphoglycerate to ADP by phosphoglycerate kinase, forming ATP and 3-phosphoglycerate. At this step, glycolysis has reached the break-even point: 2 molecules of ATP were consumed, and 2 new molecules have now been synthesized. This step, one of the two substrate-level phosphorylation steps, requires ADP; thus, when the cell has plenty of ATP (and little ADP), this reaction does not occur. Because ATP decays relatively quickly when it is not metabolized, this is an important regulatory point in the glycolytic pathway..
ADP actually exists as ADPMg-, and ATP as ATPMg2-, balancing the charges at -5 both sides. Phosphoglycerate mutase now forms 2-phosphoglycerate. Glycolysis is regulated by slowing down or speeding up certain steps in the glycolysis pathway. This is accomplished by inhibiting or activating the enzymes that are involved. The steps that are regulated may be determined by calculating the change in free energy, ΔG, for each step. If a step's products and reactants are in equilibrium, then the step is assumed not to be regulated. Since the change in free energy is zero for a system at equilibrium, any step with a free energy change near zero is not being regulated. If a step is being regulated, then that step's enzyme is not converting reactants into products as fast as it could, resulting in a build-up of reactants, which would be converted to products if the enzyme were operating faster. Since the reaction is thermodynamically favorable, the change in free energy for the step will be negative. A step with a large negative change in free energy is assumed to be regulated. The change in free energy for each step of glycolysis estimated from the concentration of metabolites in an erythrocyte. 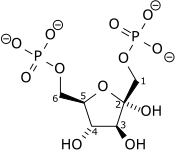 In the second regulated step (the third step of glycolysis), phosphofructokinase converts fructose-6-phosphate into fructose-1,6-bisphosphate, which then is converted into glyceraldehyde-3-phosphate and dihydroxyacetone phosphate. The dihydroxyacetone phosphate can be removed from glycolysis by conversion into glycerol-3-phosphate, which can be used to form triglycerides. On the converse, triglycerides can be broken down into fatty acids and glycerol; the latter, in turn, can be converted into dihydroxyacetone phosphate, which can enter glycolysis after the second control point. The three regulated enzymes are hexokinase, phosphofructokinase, and pyruvate kinase. The enzymes are potential sites of control, and all three enzymes serve this purpose in glycolysis. Yeast hexokinase B. PDB 1IG8. In animals, regulation of blood glucose levels by the pancreas in conjunction with the liver is a vital part of homeostasis. In liver cells, extra G6P (glucose-6-phosphate) may be converted to G1P for conversion to glycogen, or it is alternatively converted by glycolysis to acetyl-CoA and then citrate. Excess citrate is exported to the cytosol, where ATP citrate lyase will regenerate acetyl-CoA and OAA. The acetyl-CoA is then used for fatty acid synthesis and cholesterol synthesis, two important ways of utilizing excess glucose when its concentration is high in blood. Liver contains both hexokinase and glucokinase; both catalyse the phosphorylation of glucose to G6P but the latter is not inhibited by G6P. Thus, glucokinase allows glucose to be converted into glycogen, fatty acids, and cholesterol even as G6P accumulates in hepatocytes. This is important when blood glucose levels are high. During hypoglycemia, the glycogen can be converted back to G6P and then converted to glucose by the liver-specific enzyme glucose 6-phosphatase and released into the blood without taking up the low concentration of glucose it releases. This reverse reaction is an important role of liver cells to maintain blood sugars levels during fasting. This is critical for brain function, since the brain utilizes glucose as an energy source under most conditions. Bacillus stearothermophilus phosphofructokinase. 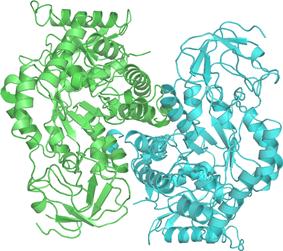 PDB 6PFK. Fructose 2,6-bisphosphate (F2,6BP) is a very potent activator of phosphofructokinase (PFK-1), which is synthesized when F6P is phosphorylated by a second phosphofructokinase (PFK2). In liver, when blood sugar is low and glucagon elevates cAMP, PFK2 is phosphorylated by protein kinase A. The phosphorylation inactivates PFK2, and another domain on this protein becomes active as fructose bisphosphatase-2, which converts F2,6BP back to F6P. Both glucagon and epinephrine cause high levels of cAMP in the liver. The result of lower levels of liver fructose-2,6-bisphosphate is a decrease in activity of phosphofructokinase and an increase in activity of fructose 1,6-bisphosphatase, so that gluconeogenesis (in essence, "glycolysis in reverse") is favored. This is consistent with the role of the liver in such situations, since the response of the liver to these hormones is to release glucose to the blood. Yeast pyruvate kinase. PDB 1A3W. 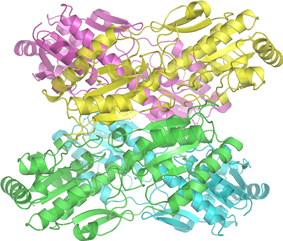 This enzyme catalyzes the last step of glycolysis, in which pyruvate and ATP are formed. 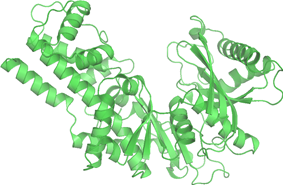 Regulation of this enzyme is discussed in the main topic, pyruvate kinase. This process occurs in the bacteria involved in making yogurt (the lactic acid causes the milk to curdle). This process also occurs in animals under hypoxic (or partially anaerobic) conditions, found, for example, in overworked muscles that are starved of oxygen, or in infarcted heart muscle cells. In many tissues, this is a cellular last resort for energy; most animal tissue cannot tolerate anaerobic conditions for an extended period of time. Some organisms, such as yeast, convert NADH back to NAD+ in a process called ethanol fermentation. In this process, the pyruvate is converted first to acetaldehyde and carbon dioxide, then to ethanol. Anoxic regeneration of NADH is only an effective means of energy production during short, intense exercise, providing energy for a period ranging from 10 seconds to 2 minutes and is dominant from about 10–30 seconds during a maximal effort. It replenishes very quickly over this period and produces 2 ATP molecules per glucose molecule, or about 5% of glucose's energy potential (38 ATP molecules in bacteria). The speed at which ATP is produced is about 100 times that of oxidative phosphorylation. The pH in the cytoplasm quickly drops when hydrogen ions accumulate in the muscle, eventually inhibiting enzymes involved in glycolysis. The burning sensation in muscles during hard exercise can be attributed to the production of hydrogen ions during a shift to lactic acid fermentation as oxygen is converted to carbon dioxide by aerobic respiration faster than the body can replenish it. These hydrogen ions form a part of lactic acid along with lactate. The body falls back on this less efficient but faster method of producing ATP under low oxygen conditions. This is thought to have been the primary means of energy production in earlier organisms before oxygen was at high concentration in the atmosphere and thus would represent a more ancient form of energy production in cells. The liver later gets rid of this excess lactate by transforming it back into an important glycolytic intermediate called pyruvate; see Cori cycle. Fermenation of pyruvate to lactate is sometimes also called "anaerobic glycolysis", however, glycolysis ends with the production of pyruvate regardless in the presence or absence of oxygen. First, pyruvate is converted to acetyl-CoA and CO2 within the mitochondria in a process called pyruvate decarboxylation. Second, the acetyl-CoA enters the citric acid cycle, also known as Krebs Cycle, where it is fully oxidized to carbon dioxide and water, producing yet more NADH. Third, the NADH is oxidized to NAD+ by the electron transport chain, using oxygen as the final electron acceptor. This process creates a hydrogen ion gradient across the inner membrane of the mitochondria. Fourth, the proton gradient is used to produce about 2.5 ATP for every NADH oxidized in a process called oxidative phosphorylation. Malignant rapidly growing tumor cells typically have glycolytic rates that are up to 200 times higher than those of their normal tissues of origin. This phenomenon was first described in 1930 by Otto Warburg and is referred to as the Warburg effect. The Warburg hypothesis claims that cancer is primarily caused by dysfunctionality in mitochondrial metabolism, rather than because of uncontrolled growth of cells. A number of theories have been advanced to explain the Warburg effect. One such theory suggests that the increased glycolysis is a normal protective process of the body and that malignant change could be primarily caused by energy metabolism. ^ a b Lane, A. N.; Fan, T. W. -M.; Higashi, R. M. (2009). "Metabolic acidosis and the importance of balanced equations". Metabolomics 5 (2): 163–165. ^ Reeves, R. E.; South D. J., Blytt H. J. and Warren L. G. (1974). "Pyrophosphate: D-fructose 6-phosphate 1-phosphotransferase. A new enzyme with the glycolytic function 6-phosphate 1-phosphotransferase". J Biol Chem 249 (24): 7737–7741. ^ Selig, M.; Xavier K. B., Santos H. and Schönheit P. (1997). "Comparative analysis of Embden-Meyerhof and Entner-Doudoroff glycolytic pathways in hyperthermophilic archaea and the bacterium Thermotoga". Arch Microbiol 167 (4): 217–232. ^ Garrett, R.; Grisham, C. M. (2005). Biochemistry (3rd ed.). Belmont, CA: Thomson Brooks/Cole. p. 584. ^ Garrett, R.; Grisham, C. M. (2005). Biochemistry (3rd ed.). Belmont, CA: Thomson Brooks/Cole. pp. 582–583. ^ Berg, J. M.; Tymoczko, J. L.; Stryer, L. (2007). Biochemistry (6th ed.). New York: Freeman. p. 622. ^ "PET Scan: PET Scan Info Reveals ...". Retrieved December 5, 2005. ^ "4320139 549..559". Retrieved December 5, 2005. ^ Maroon, J; Bost J; Amos A; Zuccoli G (May 2013). "Restricted Calorie Ketogenic Diet for the Treatment of Glioblastoma Multiforme". Journal of Child Neurology.